Drexler Apr 13 2019 6:28 am I like her movie My Son in Law's Woman, I like her acting and she is so beautiful. ❤❤❤ from Philippines!! KIM SKY Feb 20 2018 7:22 pm She reminds me of a 1980s combo version of Joyce Godenzi(Sammo Hung's Wife) and Rosamund Kwan. I think she does better with straight dramatic roles rather than the over-the-top comedic lead roles I seen her. I did like to see her in a thriller with an ultra lowcut. She has the looks and chops to play a hardboiled character due to her quasi-caucasian features. Marie Feb 18 2018 5:07 pm She likes Go Gyungpyo in Chicago Typewriter, and now again in Cross ? stellapebble Jan 30 2018 8:10 pm shes one of my fave.i wish she will have another main role project soon.so pretty and cute. 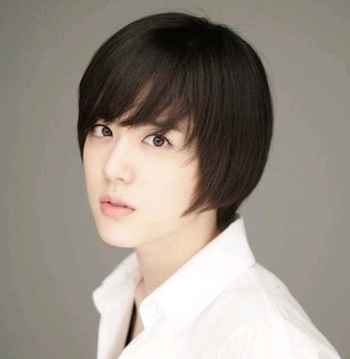 Yang Jin Sung your a good actress! good luck see you in dramaland. Pammo Oct 03 2017 8:00 pm She is an outstanding actress. Would love to see her in a period piece although my favorite for her was Bride of the Century. Really need to see her as lead actress in a strong drama. Talented and attractive as well. Waiting for her next role. I.J. Sep 29 2017 9:59 pm Doesn't she look like Kim Yoo Ri from The Master's Sun?? Ei Thin Zar Soe Jun 06 2017 8:44 am The actress is really good at acting! I've watched several dramas of her and she never fails to make her fans happy and satisfied with her acting. Bride of the Century made me really like her. Way to go! LemonTea Jun 16 2015 4:49 am I realy like her Voice.She also look natural and super great acting and also Funny...Love you Yang Jin Sung...FIGHTING..
raxeri Apr 27 2015 11:29 pm I've become a fan since Bride of the Century. She's totally awesome because she's elegant, beautiful and a great actress! Now I started watching My Unfortunate Boyfriend, I hope to see you more in dramas. raxeri Apr 27 2015 11:28 pm I've become since Bride of the Century. She's totally awesome because she's elegant, beautiful and a great actress! Now I started watching My Unfortunate Boyfriend, I hope to see you more in dramas. alex Apr 15 2015 2:00 am She is completely carrying another show unfortunate boyfriend. She probably best actress or atleast she plays her role flawlessly. random1 Mar 22 2015 6:26 pm I loved her dual roles in bride of a century. i like those kinds of dramas where you see actors/actresses play multiple types of characters. i'm watching City Hunter right now and seeing her makes me smile. DongSaeng Jan 12 2015 3:43 am Unni SARANGHAE !! i cant wait for your new drama "My Unfortunate Boyfriend" I hope you and No Min Woo become a Real Couple in Real Life ^___^ ! Hwaiting !! tp Jan 11 2015 6:38 pm I've just got to know you the first time by watching bride of the century. You are very cute & pretty and oyu look quite young too. Best wishes! Mia Dec 15 2014 9:40 pm Love her acting in Bride of the Century. Her acting is funny and enjoyable! can't for your new dram with no min woo.!!! @sweetiepamie Sep 04 2014 5:35 am ow... first time that i saw her in city hunter ,She was so awsome so good in acting !and she was so pretty ,,cute mo talaga ..Im a k-pop lover... more ..More ,,projects tocome saranghae..Unnie im ur #0 fan in the philippines..
Donpreyel Jun 29 2014 11:35 pm Yo! You were all that and a bag of chips in Bride of the Century. I couldnt stop watching from 1-16 in one full day. I was never confused by the two characters. Like, you made it happen to the fullest. My wife and two daughters introduced me to Korean movies and I am glad my first one was Bride of the Century. Lim Swee Hin Jun 24 2014 3:33 pm Two thumbs up for your role in Bride of the Century. Really captivating and amazing. botc May 03 2014 9:33 pm I love your acting! You are very beautiful and talented!! The drama botc was awsome and Yang Jin Sung did a really REALLY good job at acting. I hope to see you in more dramas! Deeme Apr 27 2014 2:33 am She is such a gem! She was able to make us differentiate Yi Kyung and Doo Rim! She is brilliant! I really really want Bride of the Century to be more famous and more successful! I want to see more big star-studded dramas that include her. Joannefaith Apr 11 2014 9:22 am Totally fall in love with you after watching Bride of the Century! Great and fabulous acting!!! Love your bubbly personality and just too beautiful! Can't wait to see more of you in other dramas! Lou Apr 08 2014 8:26 am Like what is everybody is saying, you have a superb acting skill. I salute you! You are such a versatile actress.You deserve to be given an award after this botc. You are very beautiful.hope you wont change your looks the way other k-drama actresses did.having undergone cosmetics/plastic surgery procedures make their looks unnatural and kinda ugly.please dont do that.stay as beautiful as you are now. Lou Apr 08 2014 8:11 am Like what everybody is saying, you have a superb acting skill.i salute you!such a versatile actress.you deserve to be given an award after this Botc is over.you are very beautiful.hope u wont change your looks as other korean actresses did.having undergone a lot of plastic/cosmetics surgery procedures make their looks unnatural and kinda ugly.dont ever follow them.stay as beautiful as you are.fighting! shriya kannaujia Apr 02 2014 1:20 pm You are pretty as well as talented! Just love your acting! i'm a huge fan!! Sharon Mar 31 2014 6:14 am Awesome acting in BotC! You stole the show from the 1st episode. Hope to see more of you in the future! ceejay_05 Mar 29 2014 12:06 am great acting..i hate you when you play Yi Kyung and i love and cried for you when you play Doo Rim..Hope to see you in more drama..
Grace Mar 28 2014 12:50 am She is a good actress. After watching a few episodes of Bride of the Century, I fell in love with her. She's so talented and acted very naturally. I will look forward to her every drama. doo rim Mar 25 2014 10:01 am Nado! I really like her acting it was funny! Esp. When she wore a long wig ha ha ha.. she's like yoon eun hye when it comes to comedy..
Giang Mar 20 2014 9:36 am I like her acting in Bride of century, it's natural and great. I have hoped to see her for a long time since the day I watched City Hunter. AsianWiki should change her photo. Kao Mar 19 2014 12:23 am I <3 her Bride of the Century!! I love that her acting is not overly cute!! and i love her character that she played in there!!! aw i hope she play more leading roles and more stronger too!!!!! Jack Mar 10 2014 7:47 pm Versatile actress ! You can portray so many different personalities in Bride of the Century... really fun to watch. flower Nov 05 2012 4:24 am she looks like han ga in..:) pretty!!! nero Jun 19 2012 12:13 am cute, beautiful, lovely voice, best thing about city hunter! would like to see her in more shows please. ooahrloo Apr 19 2012 4:22 pm I am watching city hunter and i have to say... she is just beautiful! so cute! leendvd Jan 20 2012 1:58 pm tho i am a woman and saying this about a woman (I am straight), she is far better looking than Park Min Young from City Hunter. I think she should have been the main female cast! You are beautiful Yang Jin Sung! You did a great job in City Hunter, hope to see you on a lead role next time! Kelvin Dec 23 2011 6:52 pm wao yea she is the cutest!!!!! kim shin-hyun Oct 27 2011 12:45 am ......annyeong haseyo:-) jin-sung, cheonun kim shin-hyun imnida phil's. saranghae city hunter. agan Aug 07 2011 12:26 pm cewek ini yg ngebuat gw betah nonton city hunter. . . lanjut dorama berikut kk, lok bs jd pemeran utama ya. . .
back Aug 04 2011 4:07 pm plastic surgery!! !